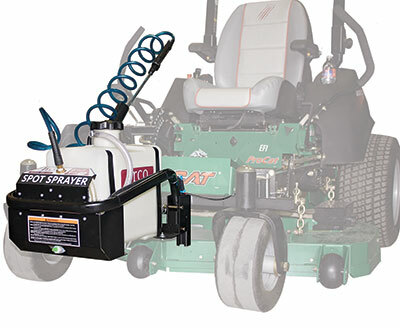 JRCO expanded its lineup of commercial mower attachments to include a spot sprayer. The JRCO Spot Sprayer attaches to the JRCO front mount system with four clevis pins and allows operators to spot spray weeds from the mower. A low-profile design allows for good visibility, and its 6-gallon capacity tank and momentary spray switch allows for an instant spray, the company said. The electric pump runs off the mower’s battery. Additionally, this model is available with or without an optional wand.